Enchant creature As Chromatic Armor comes into play, choose a color. 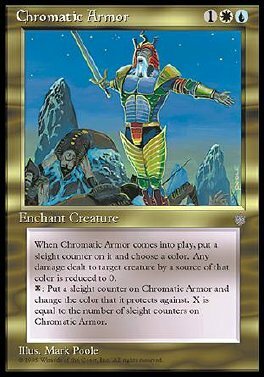 Chromatic Armor comes into play with a sleight counter on it. Prevent all damage that would be dealt to enchanted creature by a source of the last chosen color. X: Put a sleight counter on Chromatic Armor and choose a color. X is the number of sleight counters on Chromatic Armor.